Sarvi’s haleem has always been a big favorite of mine. More than a decade ago I remember being invited by a doctor friend of mine from Mehdipatnam to try out their haleem. Since then I have never missed their haleem in any season. They now serve from their Banjara Hills outlet as well as a number of franchisee locations in Hyderabad. After my visits to Café Bahar,Basheerbagh and Cafe 555, Masab Tank, Sarvi was my next stop. We reached here around 6 pm and found the place very organized. 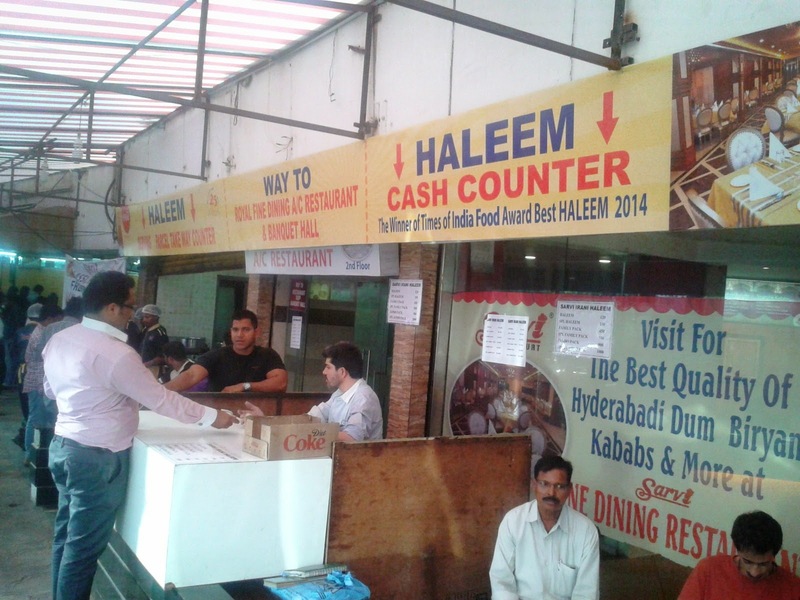 A counter has been set up to sell Haleem tokens which you have to present at the delivery counter to get your booty. Sarvi is also serving a special haleem (Rs 150) this year apart from the regular one (Rs 120). On querying I was told that the special haleem had extra onions, eggs and nuts. Though I was tempted to go for it, I decided to try out the regular one. 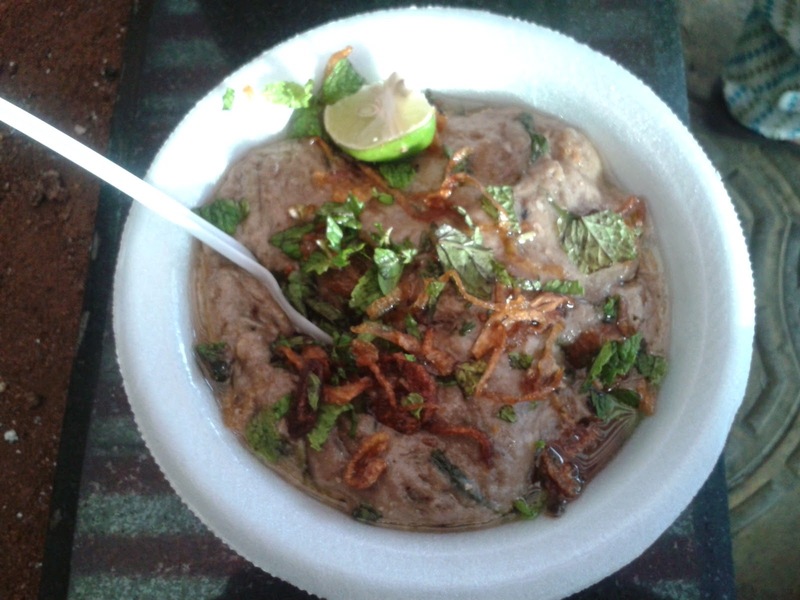 The first thing which struck me when I had the plate of haleem in my hand was the aroma of ghee in it. Sarvi had surely added extra ghee while serving the haleem. The other garnishings were much less than the Cafe 555 one I had, but that is expected since they have a higher priced special category offering this. The meat to wheat ratio was fine, and the spices were just alright. I was unlucky enough to receive a big sized bone in my plate, which effectively reduced the quantity of haleem. Though the taste of meat, ghee and spices were distinctively coming through, I felt that less fried onions, mint and no nuts handicapped the overall satisfaction. I would definitely visit this place yet again. 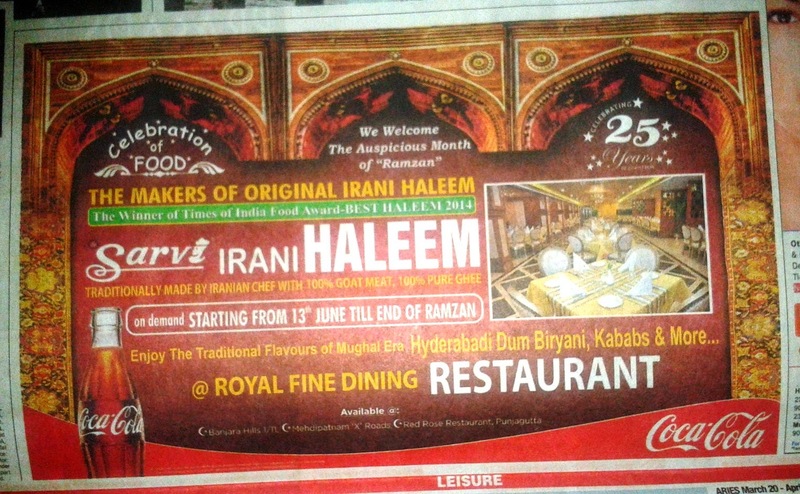 However, the special haleem at Rs 150 would be a better choice as they add more garnishing here. Unlike most of the other restaurants selling Haleem, they do not promise adding extra meat or anything fancy in their special version. The family pack which they say is good for 5 people is priced at Rs 450. Disclaimer: The feedback and ratings are based on sampling on a particular day. In many such outlets taste is not consistent, and varies from day to day and branch to branch.